The Playbill when I saw Carol Channing on Broadway. 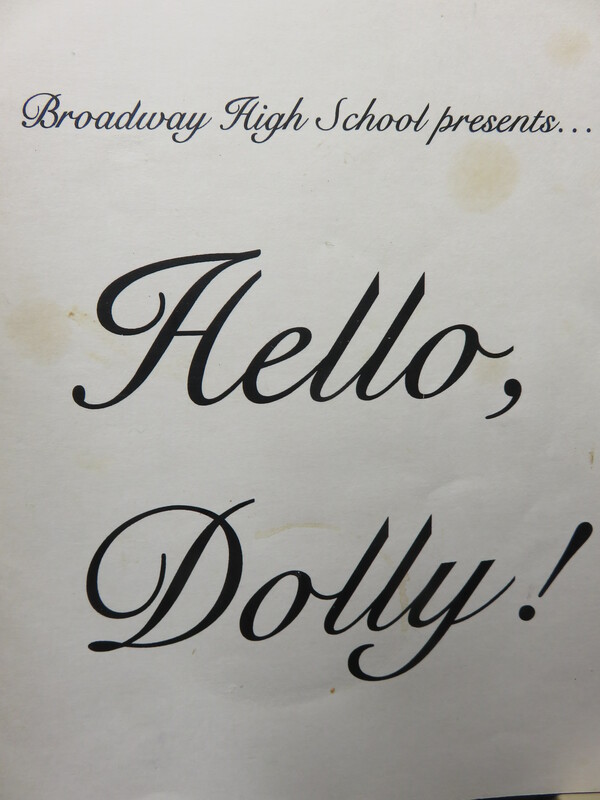 Playbill for Broadway High School, Va.’s production of the beloved musical. 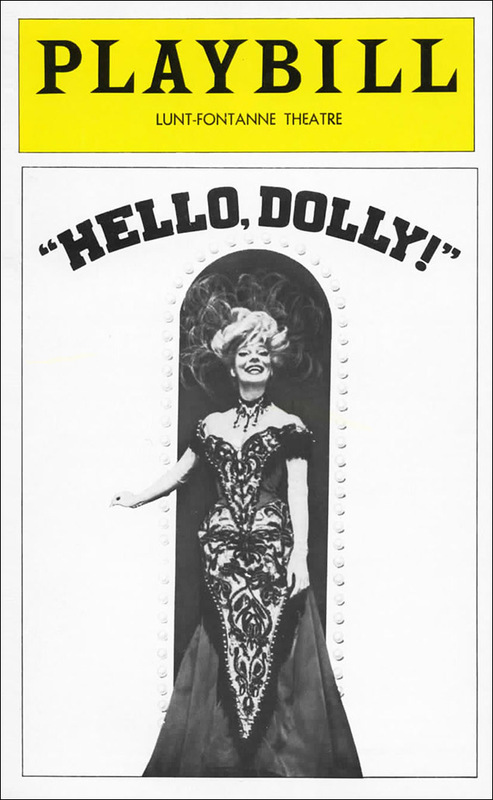 The news that Carol Channing died last month brought to my mind seeing her wonderful performance in “Hello Dolly” which I enjoyed with several colleagues in New York City around 1979 or 80. When she came down a sweeping stairway onto the stage, she not only owned the stage, but the whole theater, captured by her charisma, charm and beauty. Doing some math, I figured out that she was the same age then that I am now. I was born 30 years after her. At 5 foot 9 inches tall and with spikey heels, no wonder her presence and name, enthralled us all. A 67-year-old woman (when I saw Channing) captivating a crowd—night after night and year after year—is pretty amazing. She reprised her role in the 1990s for a final run on Broadway. I fell further in love with “Hello Dolly” as a musical when my oldest daughter was in the primary company of dancers for our local high school’s production of the long running Dolly. Our middle daughter also played flute for long evenings of rehearsal and production. Their high school, fittingly named Broadway, was among the first in our area to put on stellar quality productions that rivaled the real Broadway in many ways: set, programs, costumes, acting and singing. I was just as mesmerized with my daughters and their friends for the opportunity they had to participate in such a fun and beautiful production. For all the years of their high school experiences, we looked forward to musical weekend as if we were heading to the real “42nd Street.” I must also add that the town and high school were not named for New York City’s Broadway theater reputation, but its own long ago past as a slightly rowdy town, i.e., the “broad” or easy way of life that leads to destruction. The storyline of the musical concerns one Dolly Gallagher Levi who is a widow, a strong willed and opinionated matchmaker still mourning the loss of her beloved husband. She is hired to find a mate for one wealthy Horace Vandergelder (don’t you love these names) and travels to nearby Yonkers, New York to meet the eligible bachelor. In the process of many plot turns and surprises, she falls in love with him herself and decides she needs to get on with her life, “before the parade passes by” as she sings in one song. “I’ve gotta get in step while there’s still time left. … I wanna feel my heart come alive again …” All the while, she looks for a “sign” from her departed husband, Ephram, that this will be okay with him. Meanwhile, in real life, the same week Carol Channing died, a 40-something young widow friend shared on Facebook, that to her amazement she was feeling ready to get married again, something she never, ever thought she would do. Her departed husband, Russ, a former close colleague of mine, totally felt she would eventually do just that. They discussed this as a couple while his battle with cancer appeared to be nearing an end. To his everlasting credit, Russ himself laid the groundwork for Kendra to be able to move on. Now she and a new soulmate are preparing to marry and in anticipation of that, she and her children are moving to a different house. Her first husband’s parents and her own parents came to clean out Russ’s shop in the garage, which I’m sure brought back many memories for all of them. But I know this new couple feel God’s hand in this love they’ve found for each other, after both lost their mates to illness. Let your hearts come alive again, friends. That thought can apply of course to many situations: those making a fresh start at a new school, job, community, church, or retirement facility. It can also apply to new goals and aspirations: taking up a new hobby, pastime, or friendship—or reviving an old one that you seldom take time for anymore. Take time—before the parade passes you by. Did you or your children participate in musicals or other theater memories? I’d love to hear your highlights and stories here. How are you feeling the need to “join the parade” — or not! Comments also welcome on this theme. For a free booklet, “Walking Through Grief and Loss,” send your request to anotherwaymedia@yahoo.com or Another Way Media, P.O. Box 363, Singers Glen, VA 22834. Our son’s children were all musical and from an early age were in school plays and musicals and christian music groups. The oldest boy desire was to be an actor by profession but when he was to start university, people dissuaded him from doing this as they said he could always do it as a side line as it would be a hard field to get ahead in! After one year at university, he quit that school and auditioned to get into the 4 year theater and a music program at another University. He loved it and since his graduation 5 years ago, he is now 29 years old and is pursuing his dream in the acting field and well on his way in his beloved profession. How beautiful to hear this! Sometimes you just have to follow your dream … Thanks for sharing this story and I hope it speaks to others as well. He is at present playing in a dinner theater in Calgary Alberta Canad in a four month production of “Jersey Boys”. Prior to that he played Gilbert for a five month run of “Anne and Gilbert” in PEI Canada. In between “Gigs” he returns to Toronto ON Canada , where he works as his agent finds new auditions for him . He is happy and we are proud! That is just awesome. I would be very proud too. This is your grandson, right? Your topic is so appropriate for Valentine month. Carol Channing mesmerized me too, with her large mouth and thick lips long before collagen-enhanced smiles were considered an asset. Brava to your widow friend. I can’t imagine another “soul-mate” because I’m not in her shoes. May we all find ways to make our hearts come alive again! Great post, Melodie! Thank you Marian. Wondering if you also saw Channing on Broadway?? Yes, before collagen! I know my friend could not ever imagine another soul mate. Things happen. Blessings on your weekend, it is almost feeling like Florida here now. So welcome! What wonderful thoughts and such a great attitude to have. I love the title and am taking your words to heart.